One of the prime potential advantages of sterling clay is improved strength over fine silver clay. Adding copper to silver to make sterling is traditional for just this reason. While fine silver is easy to work with, it’s necessary to use more of it, to build heavier to take abuse, and generally to compensate for its inherent weakness. 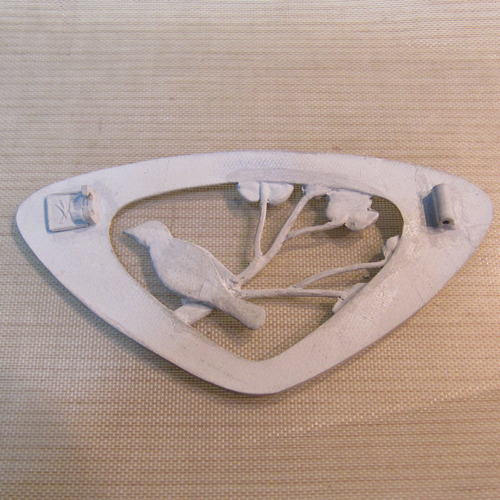 So trying a brooch for my first experiments with this material offers me the opportunity to test its mettle. 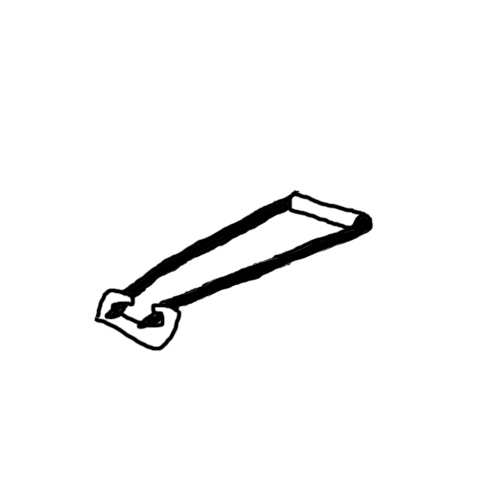 With a fine silver brooch, I’d make the pin mechanism from another material. In the past, I’ve tried a variety of approaches: perhaps an embedded commercial sterling finding with a nickel pin stem added after finishing or a handmade forged sterling wire fibula soldered in place. With sterling clay, I wanted to try making a traditional mechanism inherently designed at the clay stage. After agonizing over all the options and finding myself frozen with possibilities, I decided to stay simple for this first experiment. A double pin stem hinged clasp requires only a short piece of tubing for the hinge joint and a C-shaped catch to capture the ends of the U-shaped wire pin stem. I rolled out a 3 cards thick slab of sterling clay and rough cut it to shape with a scalpel. Then I loaded sterling clay into my extruder to make a hollow tube. Unfortunately I don’t have a hole plate for the extruder as fine as I would like, so I modified the fat tube by inserting a straight piece of wire inside, then rolling the supported tube with a flat plastic roller as if I were making a regular clay coil. When I had the thickness of the coil reduced, I removed the wire carefully to restore the hole and left it to dry on a sponge. After drying, I filed out the opening in the catch, then cut the tubing to hinge length. Both were attached to the back of the brooch, near the top to insure that the pin hangs well. After some final refining, I'll fire the piece.